Usually I write and publish articles that center on concepts, values or broad issues related to Americanism and education. This month, I am writing about a recent great experience at a local school district’s regular board meeting. Additionally, I will suggest that you can and should do the same—it’s a wonderful learning experience and you will be able to say that you acted on what you say is important to you. You will have walked the talk! A little background: I have been updating my knowledge about the K-12 world of education. Therefore, for the past year or so I have been a postdoctoral student at Sul Ross State University’s Superintendent Certification course. Dr. Galen Privitt teaches the course and he’s a very accomplished school superintendent and leader. Part of the curriculum is a requirement to attend several school board meetings. These are opportunities to observe and learn. 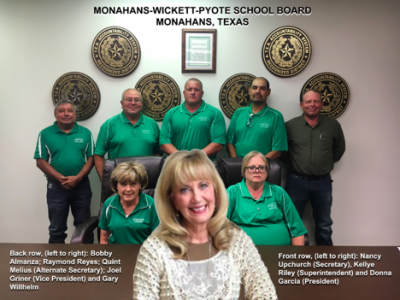 One of the school districts I chose is the nearby Monahans-Wickett-Pyote Independent School District (ISD). Here in West Texas we are steeped (no pun intended) in oil. Monahans is one of those oil and gas communities where the community grows and shrinks correlating closely to how well oil is doing. Currently, we are on a steady and fairly fast growth curve in the oil industry so Monahans is growing with it. Kellye started out with student recognitions, which are always a great part of such meetings. Individual students and groups of students stepped to the front of the board room where the superintendent and board members lauded their above-district accomplishments in the arts. Kellye has a natural and effective way of connecting with the students. It was very heartwarming to see how she recognized and talked with all of them. The school board members asked insightful and meaningful questions. They were clearly engaged in the effort. We saw no posturing, as observed in some other districts. They smiled and made everyone feel valuable as well. I wish every school district had these type of board members—selfless community leaders. The board of trustees has called for a $140 million bond election on May 4th based upon the recommendation of the district’s Community Focused Committee, a group of concerned citizens working cooperatively with the school district addressing facility needs. Kellye showed everyone a very well done factual presentation about what the bond funds would do for the district. It was one of the best I’ve seen anywhere. My wife and I went to dinner in Monahans after the meeting. We felt great about attending and we even saw some of the students who were recognized at the restaurant. The next day I wrote to Representative Brooks Landgraf, who represents Ward County where Monahans is located. I told him of our fulfilling school board visit. He’s a very supportive state representative who cares so much about what happens there. I wish that all school board meetings were this way, but we all know that they are not. It could even be your own district poisoned with bickering board members, political posturing and a disdain for the real business at hand. Unfortunately, ideology is often a loud and boisterous participant in civic life. School boards should be a place where you leave your politics at home and come together for the good of the students. Believe me, students are constantly watching our behaviors and we must be set a good leadership example for them. Learn from Monahans and districts where civility and a students-first culture is in place. As you have read, I’m using examples from the place I know and love–Texas. You can generalize this Texas story, however, and employ it to examine your own district in your state and locale. What would you like to have in your community—a Monahans or some lesser assembly? If you want to exercise your civic duties more fully, be a better American and find out what schools accomplish with your tax dollars, I heartily recommend dinner and a school board meeting to you. Get involved! Believe me, the districts would love to see you there and this makes for a much stronger Americanism in our times. Not only that, but you could get a nice dinner out of it—what a deal! If you would like to know more about the Monahans ISD “Loboes”, please visit https://www.mwpisd.esc18.net/. Author:Dr. Robert Brescia serves as Chairman of the Board at Basin PBS television and at the Permian Basin American Red Cross. His latest book is Destination Greatness – Creating a New Americanism. Bob has a doctoral degree with distinction in Executive Leadership from The George Washington University. Please contact him at [email protected] or Twitter: @Robert_Brescia.